This book deserves five stars. This is a beautiful, yet playful and exquisite poetic book, celebrating the richness of the desert written in both English and Spanish. 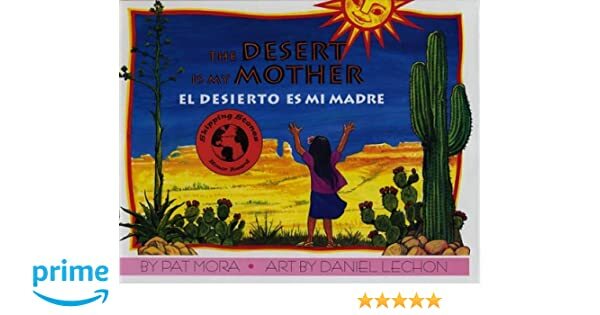 The Desert Is My Mother is a simple to read, yet richly written poem celebrating the majesty of the desert by those who understand and love it. The verses are written in both Spanish and English by Pat Mora who also understands and loves both languages. For a classroom teacher, this book makes a perfect reader's theater for including both bilingual Spanish and English students and also creates a natural springboard for discussions of language, culture, and ecology. The beautiful illustrations support the text perfectly, giving important clues for readers to unlock the graceful language. If you are studying the desert, no matter what age, I highly recommend this book. If you are a parent who loves to read with your child this is a must have and if you are a bi-lingual Spanish-English parent, lucky is the child to have your two voices to bring this book to life. There's a problem loading this menu right now. Get fast, free shipping with Amazon Prime. View or edit your browsing history. Get to Know Us. English Choose a language for shopping. Amazon Music Stream millions of songs. Sinfonia from Il Pirata - Score! Amazon Restaurants Food delivery from local restaurants. Could be used to teach metaphor and poetry for beginning level ESL students. Apr 18, Denise rated it really liked it. A bi-lingual "early reader" for young children. Good for basic Spanish comprehension. 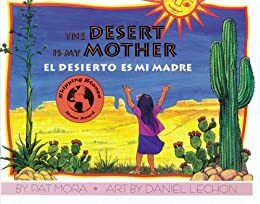 Feb 11, Julie marked it as to-read Recommended to Julie by: A bilingual text gives us a little girl who feels affinity for the desert in which she lives. The text is playful but contain's a lot of information about desert life and phenomena. Yuyi Morales rated it it was amazing Jun 25, Mallory Hanson rated it it was amazing May 12, Sue rated it really liked it Apr 09, Beverly rated it really liked it May 29, Elaine Shandra rated it it was ok Apr 20, Charlotte Gross rated it liked it Aug 29, Apr 25, Savanna Bitting added it Shelves: This book is told in English and Spanish, its vivd pictures tells a story of a little girls love for the desert. While this book doesn't have many words, or a story line, it's a great way to integrate another language in the classroom. I can use this book to teach students Spanish, it's very easy to follow! I can also send this book home with a Spanish speaking ESL student. It's a great way for them to read with their parents, since the book is in both languages. Cristina rated it it was amazing Jul 04, Elizabeth Simmons rated it it was amazing Jul 09, Elizabeth rated it liked it Mar 15, Jen rated it it was amazing Oct 18, Becca Goff rated it it was ok Feb 18, Arwen Ungar rated it really liked it Sep 23, Brittany rated it liked it Nov 07, Joni Harris rated it really liked it Feb 14, Christina Dawn rated it really liked it Jul 23, Sergio Troncoso rated it it was amazing Apr 26, Madison Nguyen rated it liked it Jun 23, Gretchen Mary rated it it was amazing Mar 08, There are no discussion topics on this book yet.